Ammonium nitrate (AN) had been a popular fertilizer since the 1920s, but hit a low in 2001 and 2002, coinciding with security apprehensions following the September 2001 events, including the attacks on the World Trade Center and the explosion at the Grande Paroisse warehouse in Toulouse, France. In May 2003, stringent measures to reduce the risk posed by AN were introduced. New legislation made it more difficult to produce, transport, and handle. Many countries have placed restrictions on AN certification, transportation, and storage. The 2013 explosion of an ammonium nitrate plant in Texas has also exacerbated the market for ammonium nitrate. Consumption of AN and other nitrogen fertilizers in Western Europe and other regions also declined because of changes in agricultural subsidy policies. Urea has become the leading nitrogen fertilizer as there are no major safety issues, it has a higher nitrogen content, and is usually less expensive to produce. Beginning around 2004, consumption of AN began to improve. Because of safety considerations, appreciable growth in global AN consumption in the form of urea–ammonium nitrate (UAN) solutions and calcium ammonium nitrate (CAN) consumption has taken place. This has somewhat offset the increased usage of urea. Consumption has begun to improve and existing facilities are being modernized/expanded or new facilities are being built or are planned. In the early 2000s, there were few new large-scale AN plants built, but during the latter half of the 2000s and continuing into the forecast period, there have been plenty of investments to upgrade older facilities and build new plants to meet demand. Historically, Western Europe and Eastern Europe (former USSR) had been the leading consuming regions, but consumption in the United States, Central Europe, China, Central and South America, and Africa has been increasing. In 2015, these countries together accounted for over 82% of total world consumption. Consumption is forecast to increase at 2.3% annually during 2015–20. China, Southwest Asia, and Southeast Asia are projected to have the highest growth rates. 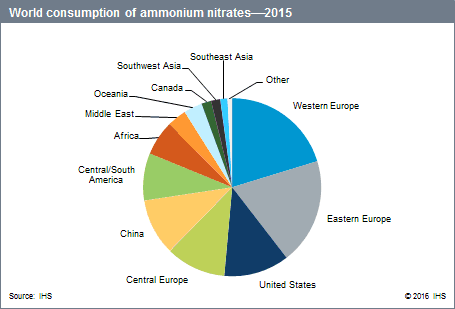 Although consumption of ammonium nitrate varies by region, the world average is approximately 65% in fertilizer applications and 35% in industrial/explosive applications. Some AN is consumed in the production of nitrous oxides, which are used as propellants. The aging population in advanced economies will result in increased nitrous oxide demand in the pharmaceutical industry. The semiconductor industry will also see rapid growth in nitrous oxide use in chemical vapor deposition, diffusion, rapid thermal processing, and chamber seasoning applications. Explosive applications (including blasting agents) account for nearly 98% of industrial applications, with the production of nitrous oxides accounting for the remaining 2%. Total world ammonium nitrate (AN and CAN) capacity, production, and consumption are dominated by Eastern Europe, Western Europe, Central Europe, China, and the United States. Combined, these five regions accounted for approximately 77% of capacity, 81% of production, and 74% of consumption in 2015. Africa and Central and South America are also large consumers. The overall nitrogen fertilizer market is projected to grow at just over 1% annually during 2015–20, led by growth in urea consumption. Urea is less dangerous to handle, has a higher nitrogen content, and is usually less expensive to produce than AN. As a result, total ammonium nitrates will continue to lose market share, although the volume will continue to grow at just over 2% annually during 2015–20 as more consumers switch to CAN or use urea ammonium nitrate (UAN) solutions for ease of handling and safety, and in industrial explosives applications.